The Oakland City Council is expected to vote on a ceremonial resolution that would encourage business owners to create sanctuary workplaces. "We don't want the federal government coming in and raiding, and taking people away, and breaking up families causing harm to people," said Dan Kalb, a councilman who proposed the resolution. "It helps no one." If passed, the proposal will not change any laws. Kalb is hoping the declaration will encourage business owners to do all they can to protect low-income and undocumented immigrants. "We want to defend workers no matter where they come from," Kalb said. 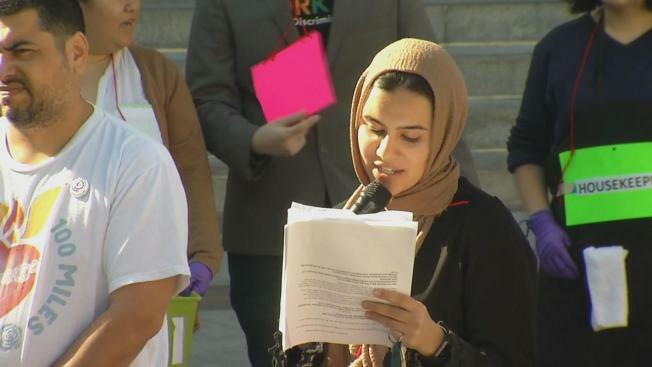 On Tuesday afternoon, a group gathered in downtown to speak on behalf of undocumented immigrant workers. "There's a huge hotel boom right now. We want to make sure all the new employees that are coming to the city know this is a city where immigrants are safe," said Asha Dumonthier. "We believe that all people deserve safe working conditions, fair wages, and the right to stand together without fear." Many people who attended Tuesday's rally said they will be participating in a strike on May 1, when thousands of people are expected to walk off the job in honor of immigrants rights.